Making biodiesel at home is indeed very possible without a degree in chemistry. Thousands of people who drive vehicles that use diesel fuel save money using this great green tip, and you can too. Soon you'll be driving past all the gas stations with a smile on your face. Before you get started making huge batches of biodiesel, you should make a small batch to ensure that you know what you're doing. 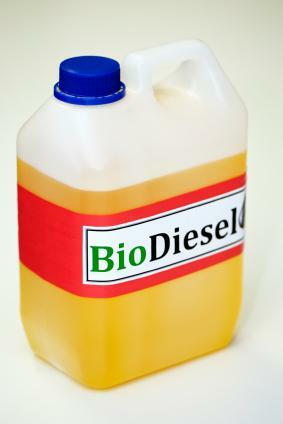 This small-batch recipe for biodiesel will make 1 liter of fuel, it is simple to do, it is possible to make with commonly-available implements, and is scalable for larger batches. If you need help downloading the printable recipe, check out these helpful tips. The supplies that you'll need for this kit are minimal and you probably already have some of them laying around your home. 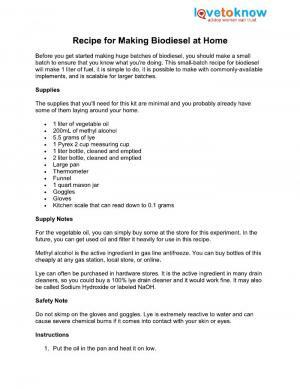 Download and print this biodiesel recipe! For the vegetable oil, you can simply buy some at the store for this experiment. In the future, you can get used oil and filter it heavily for use in this recipe. Methyl alcohol is the active ingredient in gas line antifreeze. You can buy bottles of this cheaply at any gas station, local store, or online. Lye can often be purchased in hardware stores. It is the active ingredient in many drain cleaners, so you could buy a 100% lye drain cleaner and it would work fine. It may also be called Sodium Hydroxide or labeled NaOH. Do not skimp on the gloves and goggles. Lye is extremely reactive to water and can cause severe chemical burns if it comes into contact with your skin or eyes. Put the oil in the pan and heat it on low. Mix the methyl alcohol with the lye in your mason jar and mix it together thoroughly. Once the oil reaches 130 degrees Fahrenheit, funnel it into the 2 liter bottle. Add the methyl alcohol and lye mixture to the 2 liter bottle. Screw the cap on the bottle and shake it continuously for at least five minutes. Turn the bottle upside down and rest it in the mouth of the mason jar. Let it sit like this for at least 2 full days. You will notice the differentiation between the glycerin and the biodiesel as visible layers in your bottle over time. After two days, slowly open the bottle cap over a sink or over the mason jar-- only enough to barely let a gap open. Squeeze the bottle gently to force the glycerin out of the bottle through the small gap created between the bottle and the cap. Once the visible layer of glycerin is gone, you are left with low-grade biodiesel. If all you want is to try out making biodiesel for yourself, this will be enough to run your generator or any other engine. However, it is full of impurities and will cause buildup over time. If you want a more long-term solution, you will have to get the water and other impurities out. A simple way to do this is with a water wash. Essentially, all you are doing here is adding a 1:1 ratio of water to your biodiesel, being careful to add the water very gently. You should then turn the bottle upside down for 24 hours as you did when creating the biodiesel itself. After this 24 hours, you will notice a separation between dirty water on the bottom and biodiesel on top. You let out the dirty water on the bottom in the same way you let out the glycerin in the regular recipe. You repeat this over and over again until your biodiesel no longer creates this layer. You then leave the biodiesel sitting open for a week to let the remaining water evaporate. At this point, you have a relatively pure biodiesel that shouldn't cause your engine any issues. This method is significantly more time consuming, but less expensive than using a biodiesel processor. The Biodiesel Kit Store offers kits and accessories as well as a workshop to teach you how to make biodiesel. Allegro Biodiesel offers small home processors to large farm-sized units. Don't be afraid to try this at home. Do some research and read all that you can about the process. Many companies that offer kits and accessories also offer support to answer any questions that you may have. It may seem a bit complicated, but once you start it will seem simple. Soon you'll be on your way to a more earth-friendly way of living. There are few things in the world that are as liberating as making your own fuel. When you are able to break free from the shackles of whatever oil companies decide to charge you for fuel, the feeling is unparalleled. Making biodiesel at home truly is one of those DIY projects that is worth the time and effort. Just be sure to play it safe and always use safety gear.